Basics for a Bargain: Pretty & Patterned Separates To Amp Up Your Solids (Dedicated to Lisa)! When it comes to new style resolutions for 2015, an easy way to spruce up a boring wardrobe or upgrade to a more mature style is to step outside of your comfort zone & that starts with prints. An attention to detail immediately shows off your personality & gives off a very positive first impression. I’ve learned (from shows like What Not to Wear) that when you put a thoughtful effort into what you’re wearing, you’ll have more confidence & the people around you will notice. I’d like to dedicate this post to my favorite cousin, Lisa, who has turned to me with advice & questions on how to dress more appropriate to her age, while shopping on a budget & discovering who she is through her own personal style. 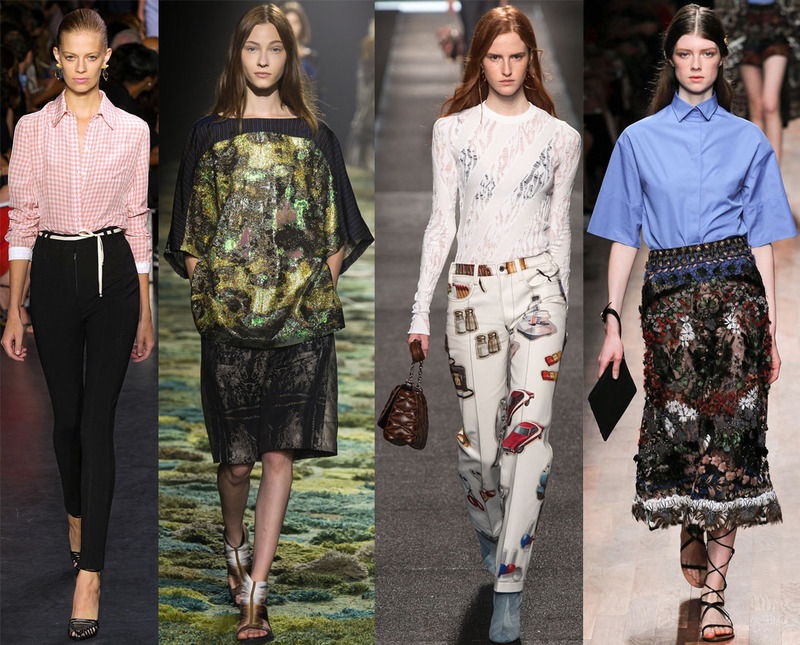 When it comes to prints, there are a lot of opportunities to discover your personal style, which is why I turned to recent Spring 2015 Ready-To-Wear runway collections for a little inspiration of what’s trending this coming spring. Of course, not all of these outfits are meant to be taken literally as inspiration, but it’s apparent that the range of prints, from classic to crazy, will instantly amp up any look, including those from Altuzarra, Dries Van Noten, Louis Vuitton, & Valentino. Also, when it comes to prints, mixing separates with basics is the perfect way to build a variety of outfits for day, work, night, & weekend looks, as seen with these tops & sweaters on actress Jessica Alba, model Miranda Kerr, Glee star Lea Michele, fashion darling Alexa Chung, singer Gwen Stefani, & it-girl Kendall Jenner. Also, A-listers know how to play with prints when it comes to bottoms, which is why I sought out chic printed shorts, skirts, & pants. Examples include The Americans star Keri Russell, Victoria’s Secret supermodel Alessandra Ambrosio, Oscar nominee Reese Witherspoon, TV personality Kelly Ripa, style icon Olivia Palermo, & actress / fashion blogger Jamie Chung. And so… with a budget shopper in mind, I’ve searched high & low to find great deals on stylish printed separates. First, these printed tops are great building blocks to a more sophisticated look, when layered with staples like a military or moto jacket, flyaway cardigan or cropped bolero, or with leather leggings, tuxedo pants, dark denim jeans, or bootcut trousers. 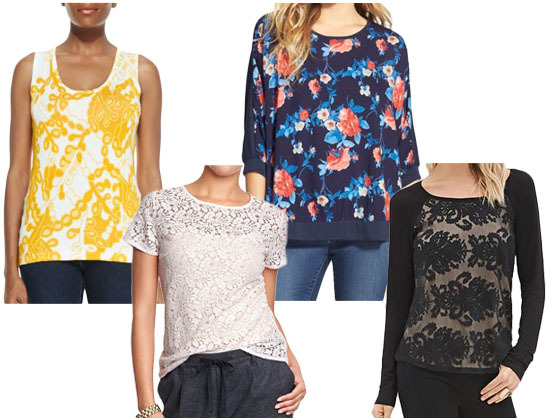 SHOP: printed tank ($22.50) @Neiman Marcus, lace tee ($14.97) @Old Navy, print top ($22.80) @Nordstrom, & black top ($22.90) @Forever 21. 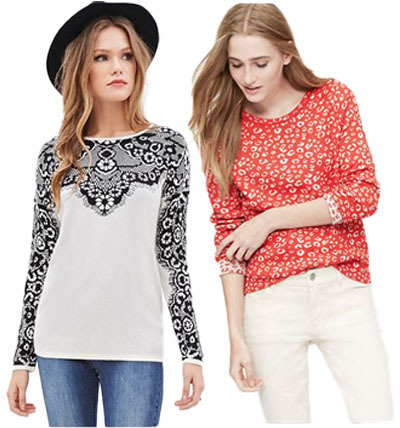 Also, printed blouses are must-haves when you’d like to sport a clean, professional look. Not only do smaller patterns work on flowy toppers, but they’re great for when you really want to go all out with your prints & mix them with other bolder prints, like animal spots, polka dots, colorblocked stripes, & many more. 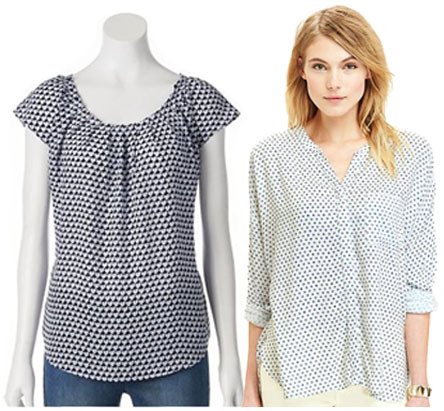 SHOP: heart blouse ($24.99) @Kohl’s & shirt ($29.94) @Old Navy. In these colder months, printed sweaters are a fun way to play with patterns, while also staying warm. Also, sweaters in different textures will surely show off a variety of colors to play with when it comes to accessories too! SHOP: lace sweater ($27.80) @Forever 21 & animal sweater ($32.99) @LOFT. When headed to the office in a dress or skirt outfit, try on a printed cardigan to wear open or closed over basics like a button down shirt, scoop neck tee, tie-neck blouse, or ruffled camisole. 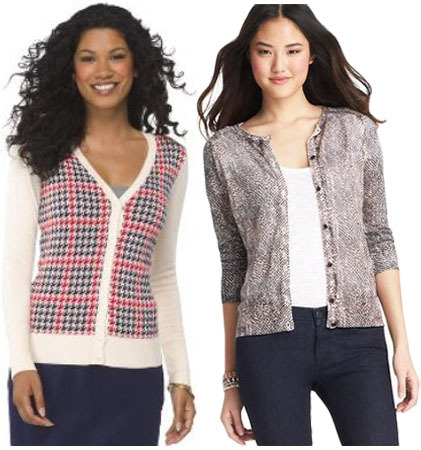 SHOP: houndstooth cardigan ($22.99) @Target & snake cardigan ($11.93) @LOFT. When it comes to bottoms, we’re often so quick to pick out a pair of jeans or leggings, but wearing prints on your lower half is unexpected & certainly a way to get the most out of your solid tops, like a black turtleneck, three-quarter sleeve sweater, or pocket tee. However, printed skirts are fun since you can not only layer with neutrals, but also enhance your look with a pop of color. 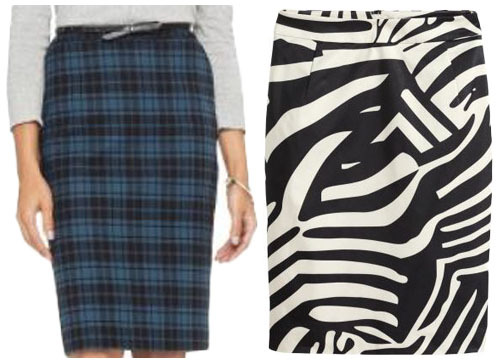 SHOP: plaid pencil skirt ($24.99) @Target & zebra skirt ($29.95) @H&M. 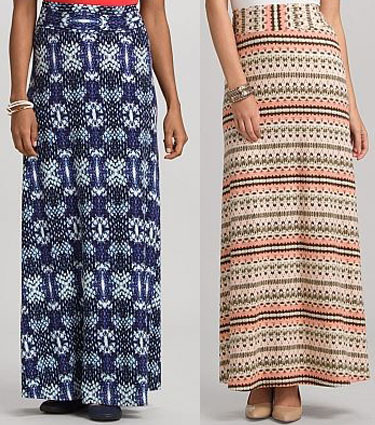 Maxi skirts are everywhere & great when headed on vacation, to a day by the water, or lunch with the girls, which is why playing with printed maxi skirts has so many possibilities, especially with metallic gladiator sandals, riding boots with button details, & textured wedges. SHOP: snake maxi skirt ($30.00) in blue @Dress Barn & print maxi skirt ($30.00) in coral @Dress Barn. For those who dare to wear shorts, think outside of the box with printed shorts in delicate fabrics. not only can these be perfect for day, but they’re easy to dress up with decadent pieces in lace, leather, & brocade. SHOP: chevron shorts ($23.30) @Saks Off Fifth & shorts ($24.99) @Kohl’s. Printed pants aren’t new, but not everyone gives them a chance, especially when concerned about emphasizing your assets in an unflattering way. 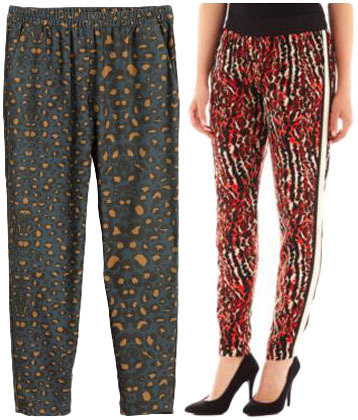 However, loose-fitting pants in subtle prints are perfect for neutral tops & jackets when on the go. These are also great for pairing with ballet flats or pointy toe stilettos. SHOP: pants ($12.00) @H&M & stripe pants ($19.99) @JC Penney. Lastly, I’m certainly not saying that anyone should abandon jeans in any way, but perhaps instead of wearing regular washes, try a printed jean, which will not only perk up a casual look, but will surprise those around you, especially when paired with a blouson top, graphic tee, or tunic sweater. 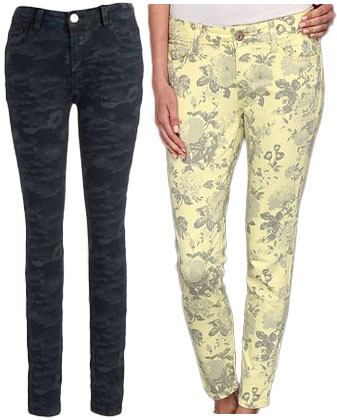 SHOP: camo jeans ($26.55) @Lord & Taylor & floral jeans ($24.99) @6PM. Must-have prints to have in your wardrobe, yet worn with caution, include polka dots, animal prints, graphics, modern florals, lace, stripes & chevron, tribal, plaid, & houndstooth. I even made a quick guide to learning prints, which will perhaps also serve as a chart on how to successfully mix prints too. Which prints are you naturally drawn to wear? How do you like to wear prints? Do you mix prints with solids regularly? For more stylish posts, check out all of the runway looks from Christian Dior’s Spring 2015 Ready-To-Wear collection, tips on how to dress your body type, the complete red carpet gallery of this year’s Screen Actor’s Guild Awards, & spring dress predictions inspired by designers Erin Fetherston & Nanette Lepore! Happy Styling! 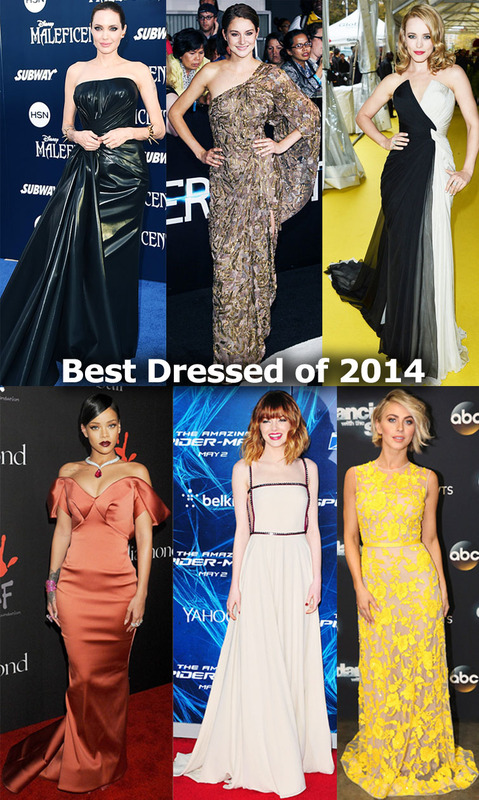 Red Carpet Review: 365 Best Dressed Looks From A Fabulous & Stylish 2014! 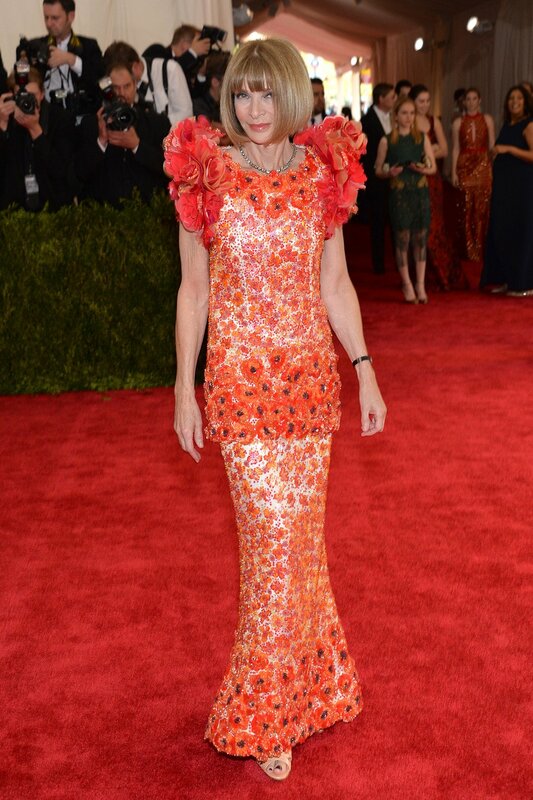 Obviously, 2014 has been one stylish year, especially when you consider the multitude of red carpet appearances, street style looks, cocktail frocks, & day-to-day ensembles that our favorite Style Darlings have sported. A number of breakout stars have made the best dressed gallery. It’s really incomplete since there are still so many gorgeous looks worth talking about that have made this calendar year a little bit more stylish. Enjoy the gallery & slideshow, featuring a thorough & vast collection of images to inspire an even more fashionable 2015. Happy Styling!